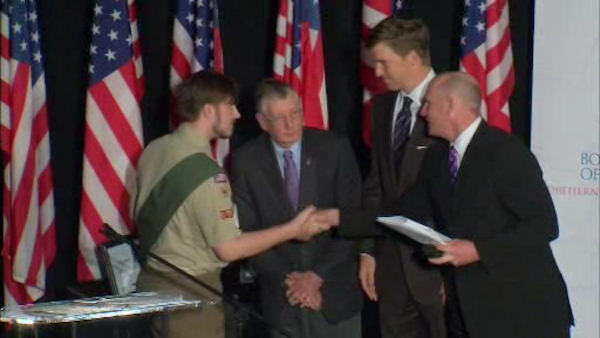 EAST RUTHERFORD, N.J. (WABC) -- After using his skills to save his father's life, New Jersey Boy Scout Wyatt Benson was presented an award for his heroics by New York Giants quarterback Eli Manning Tuesday night. Wyatt was at the beach with his family last August when his father Jim got caught in a rip current. That's when Wyatt stepped into action and used his scouting skills to help guide his father out of the current and safely back to shore. "Wyatt was able to get ahead of me and out of the riptide, but he made sure to keep tabs on me. As he was taught in cub scouts and boy scouts he kept calm in an emergency and he tried to keep the victim, me, calm too," Wyatt's father Jim said. Wyatt was presented the National Medal of Merit Award in front of over 500 people at the Northern New Jersey Council's Prepared for Life Dinner.